Morgan and I were laying out by the pool, enjoying the 90+ degree weather and a glass of Kunde Sauvignon Blanc when we decided to make soup for dinner. Soup?! On such a hot day. Yes. I love soup, even during the warmer months, but I don’t experiment enough with making them. It was settled then. Soup it was. We both love Thai cuisine and decided to integrate similar ingredients used in Thai cooking to build our Coconut Milk & Poached Salmon Soup. And what better way to brighten up the strong aromatic & spicy components of our soup than with a delicate blood orange salad. We rushed off to Oliver’s to pick up the essentials. Combine stock, 1/2 onion (whole – not sliced), garlic, lemongrass and ginger in a pot and bring to a boil then simmer for 10 minutes. Add coconut milk, chilies, fish sauce, and bay leaves and simmer for another 10 minutes. Strain and return the broth to the stove. 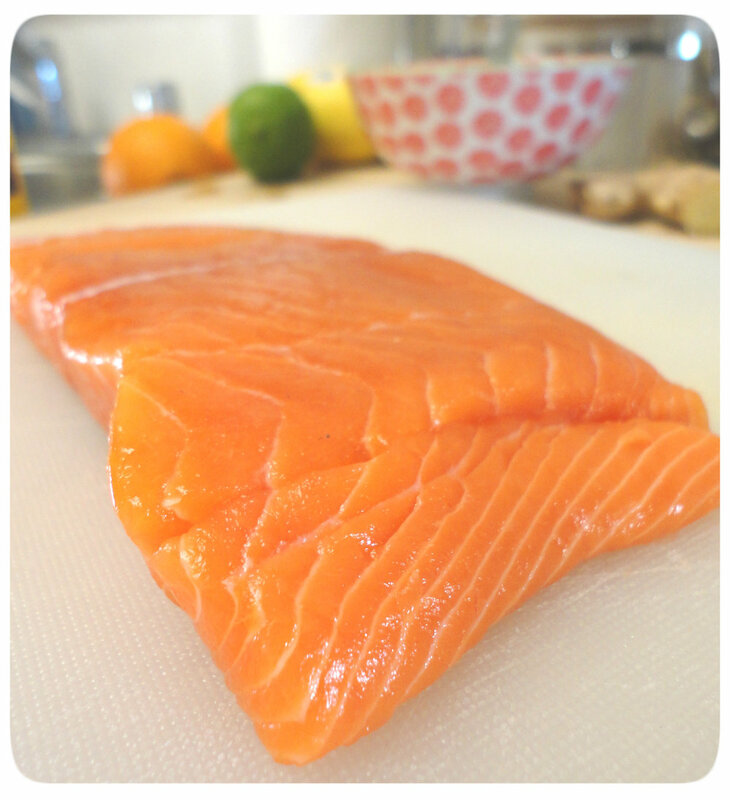 Cut the raw salmon filets into small chunks, add to the broth and simmer for an additional 10 minutes. Once the salmon is cooked thoroughly, add in juice from one lime, cilantro and salt. 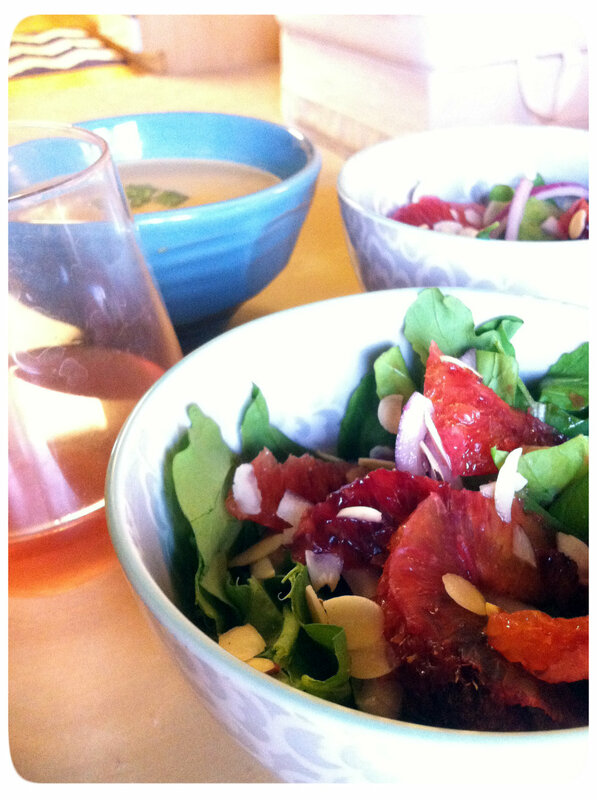 Serve immediately with blood orange salad and vino of your choice. 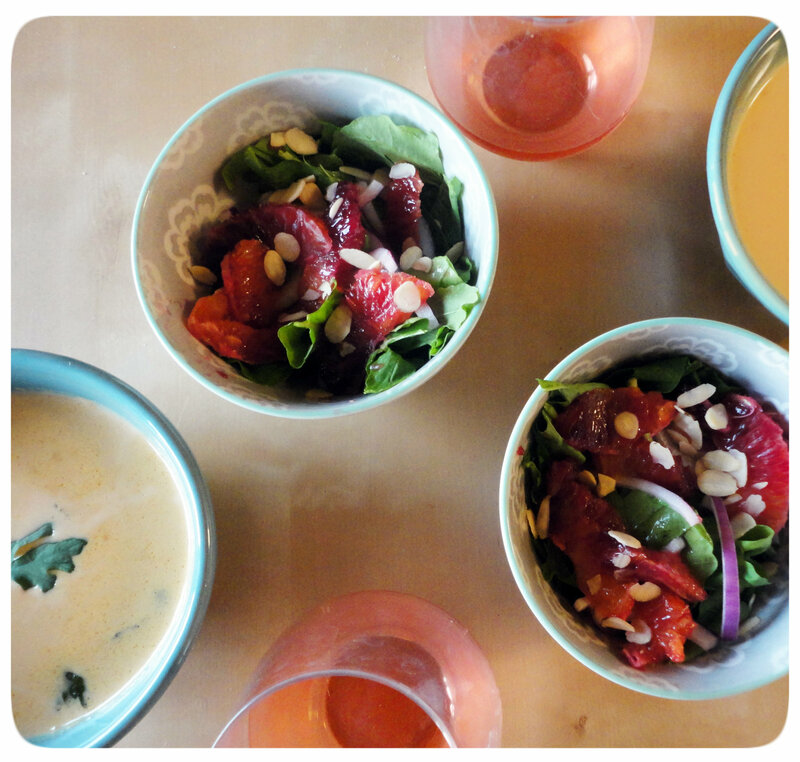 We were out of the Sauvignon Blanc so we enjoyed a glass of Rosé with our dinner which paired great with the spicy kick in our soup. Don’t have bottle of Rosé or Sauvignon Blanc? Pinot Gris or Gewürztraminer would also be a fine match. Combine all citrus vinaigrette ingredients and set aside. Cut the skins off of the blood orange and slice orange wedges for salad. Combine oranges with arugula, onions and almonds and toss with citrus vinaigrette.